A few newsletters ago we wrote about feline depression and introduced a new flower essence: Emotional Sunshine which will brighten up the mood and emotions of a depressed cat. We asked our good buddy and Feline Editor At-Large Sir Issac Newton to chime in with his usual insights and charming wit to talk about feline depression from a cat’s point of view! Newton’s Purrspective – Do Cats Get Depressed? The short days of winter have made me think about how sad people can be this time of year. Depression is widely recognized as a serious problem in humans (http://www.who.int/mediacentre/factsheets/fs369/en/) so perhaps you have wondered if your cat could also be affected. Since you can’t ask Fluffy if she is feeling sad, or is worried that her life is not what she hoped, astute observation is essential. Speaking for myself, I have a delightful personality filled with a host of amusing quirks. If my staff found me hiding under the bed all day, refusing food, or ignoring my favorite catnip toys I would be at the vet’s office in the blink of an eye. All of these behaviors could be symptoms of depression and a legitimate cause for worry. First, it is important to understand that depression is not a disease in itself, but rather a symptom of an underlying condition. An exam can rule out physical problems which may be apparent only to health care professionals. If no medical problems are evident then it is time to look at mood related issues. I would start with changes in the household. Have there been additions or losses (either human or animal)? Although we cats have a reputation for being aloof we can closely bond with humans, other cats, and even dogs! This affection is part of our normal balanced routine and a disruption could lead to depression. Losing the companion who shared a sunbeam can be devastating. On the other hand, learning to share with a new addition is also stressful. I know jealousy isn’t productive, but even perceived loss of affection is depressing. Other changes that could be upsetting include new furniture, food or daily routines. Is Tabby home alone more than in the past? 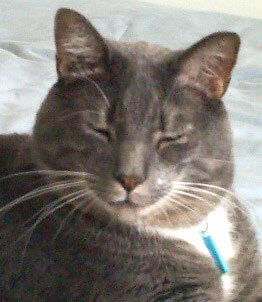 Have favorite toys or beds been lost or cleaned with something irritating to a cat’s sensitive nose? Any change could be stressful, leading to depression. Even if you can pinpoint the cause of depression you may not be able to fix it (e.g. the change was a new spouse or move to a new apartment). Change is part of life. However, there are things you can do to help restore Kitty’s emotional balance. The therapy is quite similar to that used to decrease stress. Make sure Kitty has a safe space for quiet time, but also provide environmental enrichment and quality time with you. My favorite thing is having my ears rubbed. No matter how bad a mood I am in I just can’t stop myself from purring. I have to admit that Cat Faeries Legendary Cat Toys are right up there with ear rubs when I need cheering up. 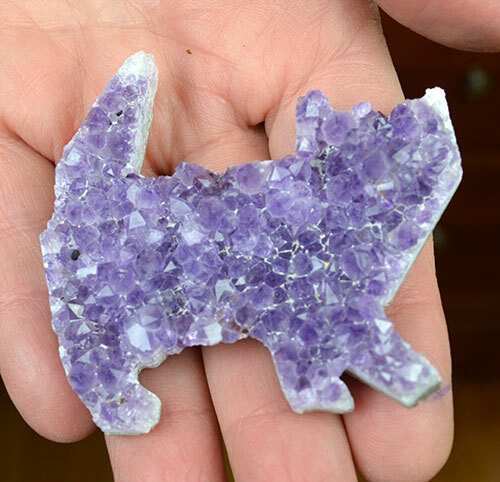 Cat Faeries also has a wide variety of products to ease stress – everything from flower essences including the new Emotional Sunshine to mood music for cats to the new cat shaped amethyst geodes (beautiful and perfect to use with flower essences). Do cats suffer from Seasonal Affective Disorder (SAD) during the short days of winter? Probably not, but given a choice you will find me napping in a sunbeam. New! Emotional Sunshine Flower Essence For Cats! Have you ever thought that you cat might be depressed but dismissed thinking that you were imagining things? Well you probably were not, feline depression is a real thing, not just a bad fur-day! Cats are happy by nature when they get to do what they enjoy like sleeping, eating, playing, resting in sunbeams, stalking, loving peace and quiet, but sometimes circumstances beyond their control cause them to become depressed. They can get gloomy and down in the dumps just like we can – and sometimes they pick up our upsets and bouts with depression. Cats will react by being mopey, sleeping more than usual, hissing at situations which never bothered them before. They might be hiding or maybe the cat stopped stop grooming or lost their appetite. They can lose weight, they can gain weight. We’ve put together our most upbeat and cheery flower essences into a bottle of Emotional Sunshine Flower Essences For Cats to chase away the blues and shake off the doldrums! If the cat exhibits signs of depression for an extended period, please see your veterinarian to evaluate any underlying health conditions. While you are waiting for your order to arrive, pick up your cat, turn up the volume and dance around the house!